Picture it: You just get home with a new pair of shoes (or two…or three...) that you can’t wait to show off. You get to your closet and…then what? Do you keep them in the shoe box until you wear them, or do you put them up on a rack or in a bin? Do you simply set them on the floor? Yes, you love shoes, and you may be wondering what’s the best way to store and organize your collection. We’re here to help with organizing do’s and don’ts for five types of shoe buyers. Find the one that sounds like you, and read on for shoe storage ideas to put your best foot(wear) forward. You own shoes for every style, season, and occasion. When you come across a good thing, you know better than to pass it up. Beyond having a well-stocked closet, owning multiple pairs of shoes allows for more variety and gives you the ability to “cycle” your footwear – which helps protect against overuse. You might be tempted to skimp on shoe storage as your collection grows – especially if your current closet storage system doesn’t expand along with it. Although over-the-door pocket organizers offer an economical option, they may not be worth it in the long run. Why cram your shoes into flimsy plastic pockets and struggle to retrieve them, or hide them inside fabric holders so you can’t remember where you put them? Instead, a custom closet system with a built-in Adjustable Shoe Organizer lets you store and display shoes properly and efficiently. Shoe towers with adjustable steel shelves give you visibility to all of your shoes and flexibility to easily move shelves so you can organize by color, style, size, or occasion. The slim profile of this type of shelving gives you more open space between shelves, maximizing vertical storage space. You choose quality over quantity. From home design and décor to furniture and organizing solutions, minimalism has quickly become a popular trend, coinciding with efforts within the fashion industry that shift away from disposable, low-quality materials to high-quality, sustainable products. Whether your quality footwear is a symbol of your passion for sustainability, or you view your pairs as investment pieces, quality footwear needs quality organization and storage. Not only do some wire shelving and racks look cheap (and probably appear out of place in your home), they also don’t work very well for shoe storage. It can be a challenge to keep items situated on wire shelves, especially if your collection consists of heels, where they may tip, fall off shelves, or get stuck in open spaces. Take care of your favorite pairs by storing them on slanted shoe shelves that are integrated into a custom closet solution. With a solid, durable surface and elegant shoe fences, your shoes stay put until you need them. The slanted design makes it easy to see your shoes and put them away, so they don’t end up on the floor and in the way. You don't have time to look for shoes. Always on the go? Feel like you don’t have time to browse for shoes – online, in stores, or even in your own closet? With work, technology, family, and more, it may seem like you’re in a constant state of busyness. 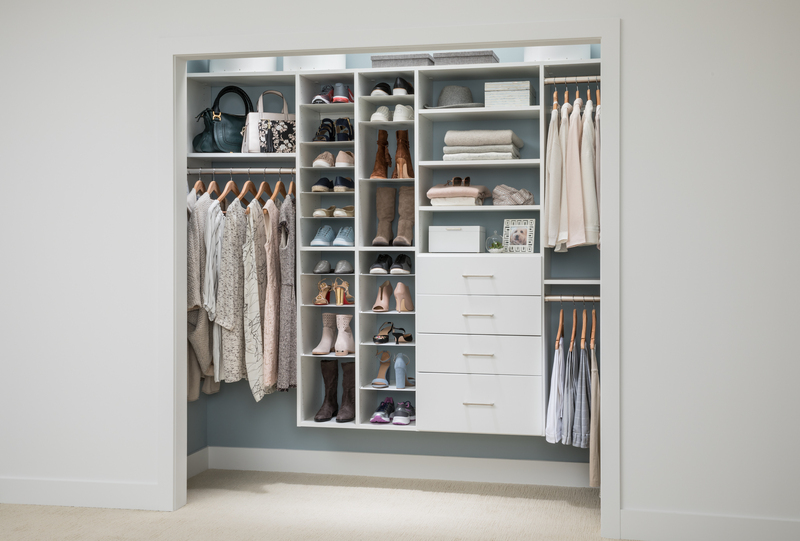 Whatever your hurry, a well-designed organization solution – starting with your closet – can help make your life more efficient. Think plastic totes and bins can help organize everything? Think again. While they might help hide the clutter, it’s almost inevitable that the pair of shoes you’ll need will be the one buried in the bottom of the bin. Stackable totes and bins are hard to see into and find what you need easily – which can make your busy day even busier. Opt instead for an Adjustable Shoe Organizer with open shelving, allowing for visibility to every pair so you can truly grab and go. You love – and always buy – a good neutral. Ever get to your destination and realize you’re wearing two different shoes? If your footwear is mainly in neutrals or dark tones, it isn’t hard to mistake similar-looking shoes as the same pair. While you could always keep a spare pair in your bag or vehicle, it may be easier to just update your shoe organization system. Even if your shoes are neatly lined up on the floor now, it’s unlikely they will stay that way. Shoes are easy to trip over and mix up, and before you know it, they’ll create a jumbled pile. If you have shelf space available in your closet, allocate an area for your favorite footwear (the pairs you wear the most) so you won’t have to bend over as often to pick up your shoes. Consider adding more shelves to your closet system or changing out one of the sections for an adjustable organizer or rack just for storing shoes. The best type of closet system is one that is versatile and adjustable, letting you easily move shelves and rods, and add to it as your shoe collection changes or grows. Look for a custom closet system with adjustable-height shelving to utilize storage space and provide easy access to your shoes while keeping them up and off the floor. You view shoes as collector’s items. If collecting Air Jordan or museum-quality Kobi Levis is your favorite pastime, you’re not alone. Over the past few years, footwear as collector’s items has grown in popularity – and there’s even science behind it. In a 2010 Cosmopolitan interview, Footnotes: On Shoes Editor Suzanne Ferriss, PhD, revealed that buying shoes actually triggers an area in women’s brains called the “collecting spot,” resulting in a rush of good feelings. "Shoes are a collector's item, whether women realize they perceive them that way or not," she said. “They're like sculptures." What’s the point of a collection if not to display it? Keeping shoes in their original boxes may preserve them, but it doesn’t allow you to showcase your footwear so you can admire them each time you open your closet doors. Opt for the Adjustable Shoe Organizer with slim profile shelves that frame each pair like art, making your shoes the focal point. You can see all your shoes in one glance and easily adjust the shelves to organize and rearrange as your collection grows. Systematic shoe storage and organization can save time, maximize space, increase visibility, and allow for flexibility as your collection grows or changes. A good organization system is one that meets your specific needs. 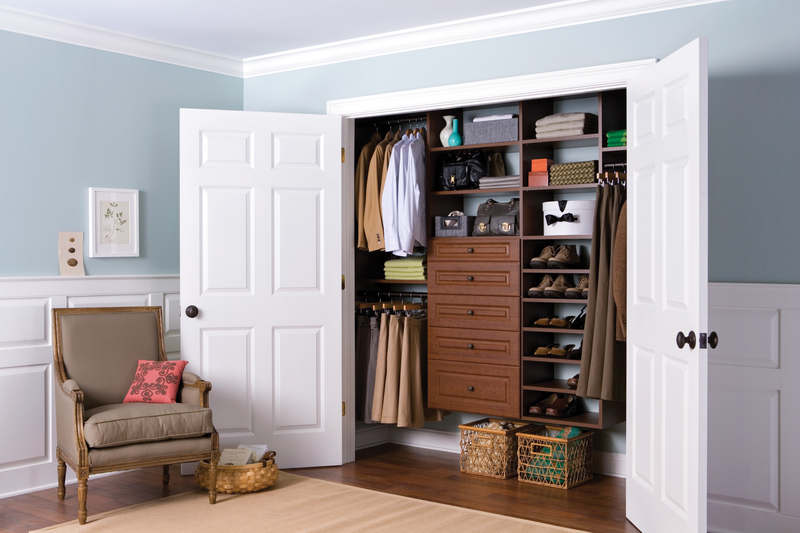 To see how you can improve organization for your shoes, browse EasyClosets gallery or contact a professional closet designer.